There’s something really enjoyable and fun about the idea of “stealth” camping. Further more, if you are a full time van-dweller, stealth camping or “boondocking”, as it is known in North America, becomes an inescapable part of your daily life. While we will always prefer to park up in an area where overnight parking is permitted, or at least tolerated, such as a camp ground, road side rest area, or wild bush camp, we specifically designed and built our van to not look like a mass produced RV so that we could stealth camp with our van where and when required. This has come in handy many times over the years. 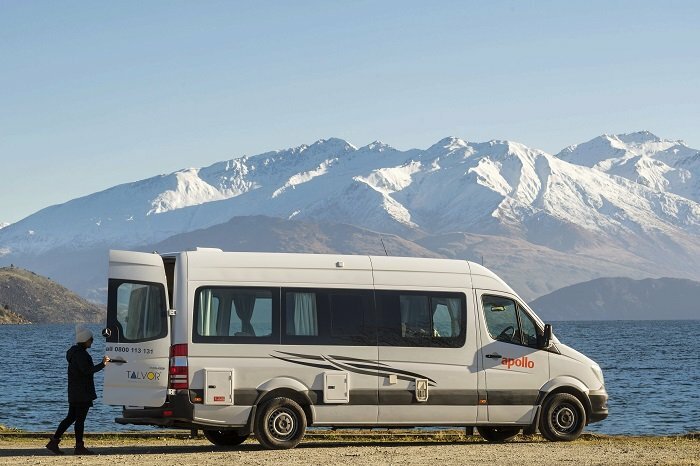 Whilst we spend most of our time exploring quiet coastal and country areas, there are occasions where we travel through major cities and towns, or popular destinations where there is no sanctioned free camping areas. Sometimes we actually want to spend some time there without attracting undue attention of local enforcement officers or local residents. To date we have NEVER been fined. Only once were we interrupted at night and asked to move on by a local security officer whilst parked up in Bowen, in far northern Queensland – a town known amongst travellers for its backwards, anti-camper policies and sentiment. All other times we have only had positive encounters with local rangers and residents who appreciated our respectful attitude and approach of keeping a low profile, not disturbing anyone, having a nice clean looking vehicle, moving on during the day, and leaving no trace. In fact we usually make a point of leaving an area we stay cleaner than when we arrived by picking up any trash on the ground and disposing of it. People do notice on occasions, and it does help to improve the reputation of van dwellers and travellers by applying these simple principles. If you arrived at a beach car park or residential area with a vehicle like this and proceeded to cook up dinner and generally make yourself at home, you will very quickly have the attention of local residents and authorities directed towards you. Unless you are in a designated overnight RV parking area, the likelihood of being woken up at 2am by a ranger or police officer is fairly high. And nobody likes being fined or told to move on at some obscure hour. 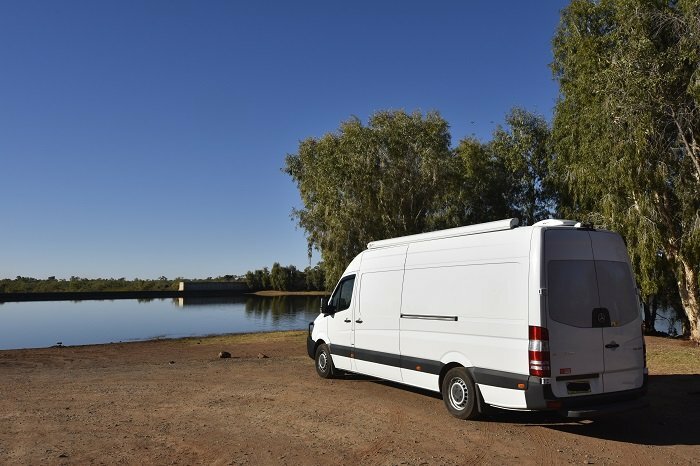 To avoid the drama and keep yourself out of trouble, there’s a few tricks that you can use to keep your vehicle as clean and uncluttered on the outside as possible, and also maintain your privacy while van-dwelling. Before we go further, we’ll freely admit that our van is not the perfect example of a stealth camper – the solar panels are visible from one side, and the roof mounted awning is visible from the other side. Finding the right mix of stealth vs functionality and comfort will come down to you and the areas you park. Despite these factors we often have people comment to us that our van looks like a standard cargo van at first glance and they are surprised when they see the interior fit out. This is good enough for us! Many motorhomes in Australia have an assortment of hatches and doors on the side of the vehicle. These are to allow convenient access to water, AC power hook ups, gas (LPG/propane) bottles, storage compartments, barbecues, chemical toilet cassettes, fold down outdoor tables, fridge and heating vents, and so forth. 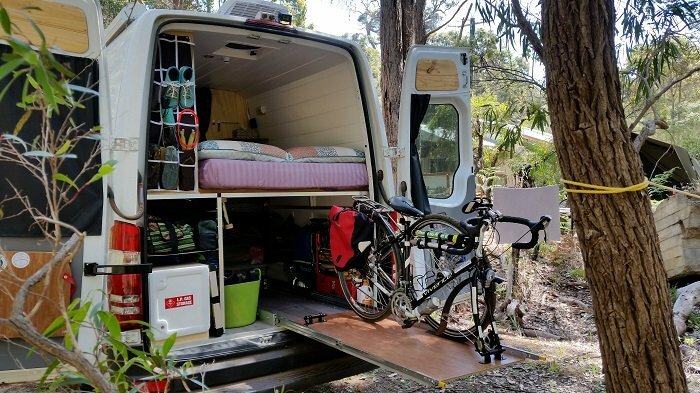 Whilst they do make it easier while parking up at caravan parks with all the hook-up options, they also scream out to everyone nearby that this is a recreational vehicle. It’s OK to have one or two small hatches or vents, provided they are colour matched and placed in a low profile location, but if you want to keep your vehicle looking clean and stealthy it’s best to keep your water, power and gas bottle access points underneath or inside the vehicle. Please ensure that AC power hook-up points are robust, protected from the elements and rubbing, and installed by a qualified electrician. Additionally, gas bottle storage boxes often have legal requirements to be installed in a durable, water resistant box which is ventilated to the atmosphere (outside of the van) in case it leaks. In most Australian states and territories, the gas bottle box and gas fittings must be inspected and certified (plated) by a licensed gas fitter/plumber. If they are not installed in accordance with local regulations the vehicle’s insurance and registration may be void in the case of a mishap – so be careful and ensure it’s done right! These regulations generally apply in all developed countries to some extent, please do check with your local authorities to find out what is required. This is a contentious topic. Some people are very critical of the idea of a van with no or very few windows, we’ve heard it being described as being like a “coffin” and too claustrophobic. 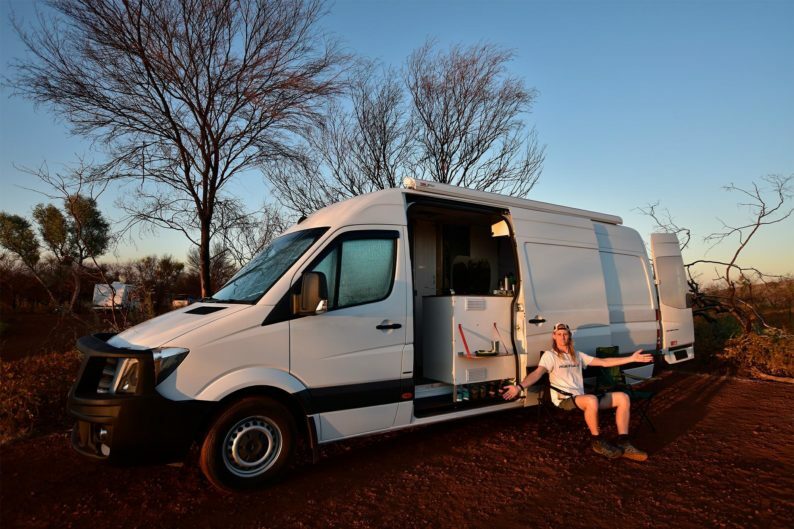 Whilst this might be a fair point for someone who actually has claustrophobia, our experience has generally found these concerns to be non-existent provided the van is designed and built to be cosy, spacious and well ventilated inside. The main benefits of not having side and/or rear windows in your van are that they offer increased security, privacy, simplicity as curtains are not required for those windows, and also they help to keep the vehicle and the contents insulated and protected from the sun’s heat and UV. Our Sprinter van has no side windows, but it does have factory installed rear windows and a big sliding door. Unless the weather is really awful we generally have the side sliding door open to allow fresh air, views and natural light. There’s also plenty of light from the front and rear windows with the curtains open. We also have three roof top air vents which we open to allow fresh air and natural light inside. The interior of our van is kept warm and homely by ensuring we have lots of warm white LED down lights, bright white walls and ceiling, and space to sit down to eat, relax or work. If you really want to add a side window near your bed, especially if you don’t have rear windows, there are some good options for small, wide utility windows which slide open to allow fresh air. These keep the van looking commercial, while providing a window to use. One of the main reasons we went with a large cargo van like the Sprinter over a small bus like the legendary Toyota Coaster was the large barn doors at the back of the van which allow easy access to the storage compartment and “garage” under the bed. This allows us the space and accessibility to store our two bicycles and other equipment out of sight. Having bicycles, gas bottles, surfing paraphernalia and other equipment strapped to the roof or back of a van is a clear signal to people that the vehicle is used by travellers and/or being lived in. There is also at risk of being associated with outdated and unfair stereotypes. Having equipment stored inside the van also helps to protect them from theft, vandalism and environmental factors (sun damage and rust). It’s a bit of work to keep it inside and internal storage space is reduced, but it was well worth it for us. We love blockout curtains and have been using them since our original Delica build back in 2014. In our new Sprinter build we managed to get some rare black/black blockout curtain for maximum stealth. The dark coloured blockout fabric is great as it blocks out light and also makes the inside of the van look dark and empty from the outside. It really helps to keep prying eyes away from checking out the inside your van both during the day and at night. We made our own cabin divider curtain which not only helps with privacy, but it also helps keep the front cabin cool when we are driving long distances with the air-conditioning on. In addition to the cabin and rear window blockout curtains, we also made our own window inserts with reflective foil closed cell foam insulation which we used for the rest of the van in the walls and roof. The great thing about these front window inserts is that they are black on one side and reflective on the other. This means we can swap them over to either have heat reflecting foil during the day, or black privacy inserts at night! Another favourite, originally tested with the Corolla mini camper, is one-way, see through vinyl cling on the rear windows. We found a supplier of adhesive white cling on eBay and installed it ourselves on the rear door windows. The cling is awesome as someone can see through outside during the day, but it’s very difficult to see inside the van from the outside. This means we can generally leave our rear window blinds open during the day for natural light, and then close them at night when the one-way vision is reversed (as it is dark outside and light inside). For $60 and an hour of our time it has been a great investment and helps to keep the van looking subtle and commercial. 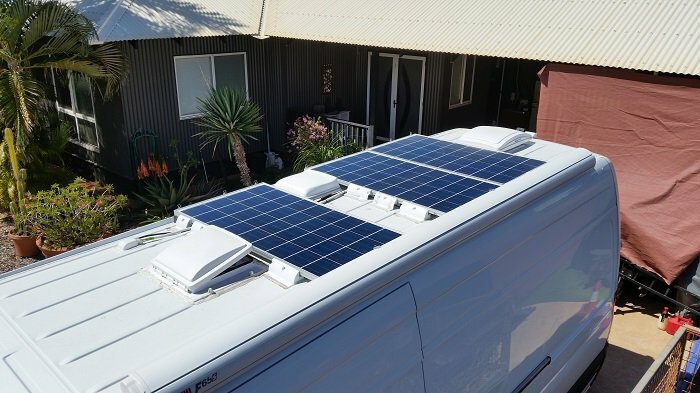 Another good reason to buy a plain white van is that most camper van and RV accessories, such as awnings, roof vent hatches and solar panel mounts, are white plastic. If external accessories are required it does help to match them to the colour of your vehicle so that they do not stand out at first glance. If there’s an external addition that isn’t body coloured, it is worth getting some colour-matched paint and painting them to blend in. It’ll help keep the vehicle looking neat, professional and clean; provided it is done to a decent standard. Nothing will have people angry and calling the authorities faster than if you have a generator running to charge your battery bank in a public area, or if you are draining smelly waste water onto the street under your vehicle. The key to stealth camping, and good free/stealth camping etiquette in general, is to always be self-contained and not annoy others or leave waste. We have an internal house lithium battery bank and roof-top solar for all our power needs. Additionally we have a 43L grey-water storage tank that is connected to our sink. This means we hold our waste water when we are parked in public areas until we are at a suitable dumping point. Our internal Thetford Curve portable toilet also makes life a lot easier when parked somewhere with no amenities, especially when the weather is cold and wet, and reduces the chance of wearing out our welcome with the locals. 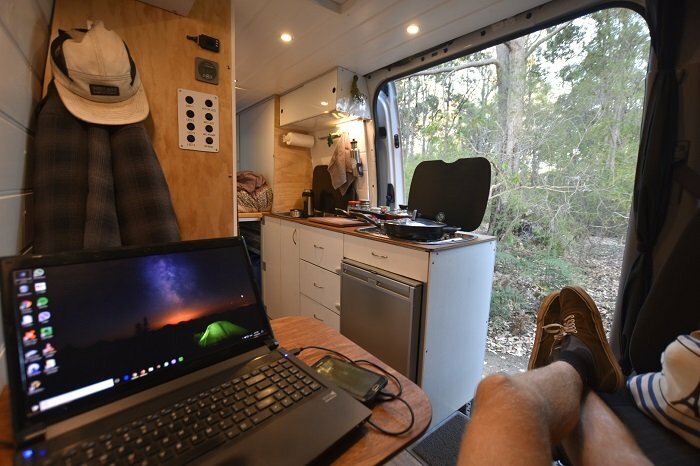 Some people have the made stealth camper vans an art form – even going as far as abstaining from awnings and getting low profile, flexible solar panels and colour matched mounts. 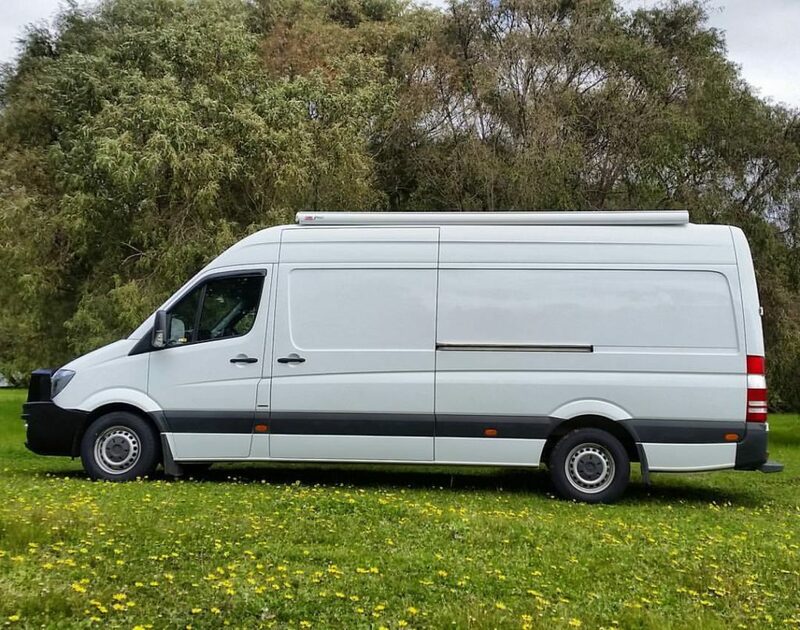 Check out this Sprinter van conversion to see an excellent example of a neat, stealthy, functional camper van. It was a major source of inspiration for us during our design and build process and should help others with ideas too. Anything we miss? What’s your top tip for a low profile, stealthy camper van? It is great to see people like yourselves sharing your experiences with likeminded people! We are also in the process of converting a Sprinter into a campervan! As you would have struggled, we are not quite sure which battery system to choose. Lithium batteries seems to be the logical solution but costs like a fortune. Not to mention the need to install a BMS which nearly costs the full price of installing a 200amps agm batteries. Would you be able to share with me and others the details – brands – costs of your battery solution? Yes, LFP batteries can be a bit expensive. We paid $1800AUD (inc freight) for our 12V 200Ah Winston LFP pack (180Ah usable), including the balancer and the cell monitor. We could have bought 2x 200Ah deep cycle AGM batteries (180Ah usable) which would have cost around $950AUD from most battery stores. So double the price, but on the flip side our 200Ah LFP battery is the size and weight of a single 100Ah AGM battery, which works much better for us as we have limited space for the battery storage and we are always cautious about adding weight to our build out. So it was worth it. Also, the LFP batteries are so much better in terms of off-grid solar/alternator charging and powering inverters and other devices compared to AGM. Bottom line: Go with lithium, just shop around to try and get a good deal on a kit or a complete set. Also impressing skills in getting the gas bottle secured without cutting the side panels! Did you get the van certified with gas and electricity? If so, can you please provide me the details so I can use the same people for my built? We are also based in Sydney. DC electrical doesn’t need to be plated/inspected and we only use DC in the van. I can send you the details of the gas fitter who plated our LPG install via email – but be warned it’s expensive.